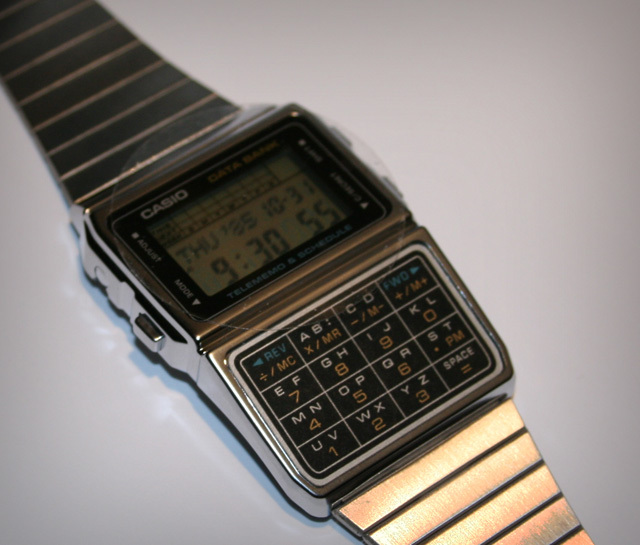 This is a lovely Casio databank watch with all the bells and whistles. It’s an NOS unused piece and is split shiny new condition – even comes with a wee instruction book in case you get lost. I’d doubt severely if you actually wanted to use this databank to watch to keep data in, but if you do, it’s more than adequate. The primary function of this watch is LOOKING COOL. Which it does with aplomb. It has the original Casio branded stainless steel strap and the watch itself wears extremely nicely. The colours on the watch are classi, so the watch is an excellent addition to any casual outfit. If you’re looking for instant cool, then you may just have found it. Be quick though, these watches are on limited supply and when they’re sold out, they’re sold out for good. So don’t come complaining to me like you did with the Commodore range, or the Novus range, ’cause I’m not listening. I would love to purchase this watch for my boy friends birthday. Is it available? How soon can you get it to me? I’m in the U.S.
Jag tar den! Eller finns den inte kvar? Hi. I also want this watch! send me mail! I def want this. Is it sthill available?? Is this watch still available and do you ship to Australia? Is this watch still available? I’m looking at this as a wonderful present and would love to buy one!